England's James Anderson says he "can bowl better" despite taking his best-ever Ashes figures of 6-47 on the first day of the third Test. The 32-year-old took four Australian wickets in 19 balls as the tourists were skittled for 136 at Edgbaston. But he said: "I was happy with the way I bowled and the wickets but I feel like I can bowl better than that. "There were a few poor shots so I think there is that possibility that we could bowl even better as a group." 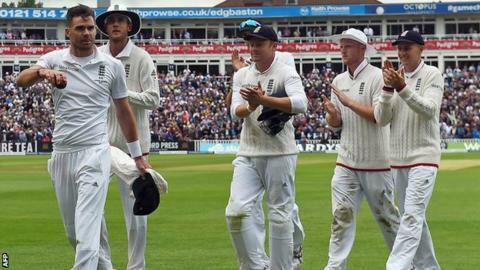 Anderson, who failed to take a wicket in the previous Test at Lord's, praised the impact of bowling coach Ottis Gibson. "I did some work with Ottis which has really helped, especially after a game where you get no wickets," he said. "You start thinking about the things you can do better, so it was good to do some work with him and get some rewards. "After getting no wickets, the confidence takes a bit of a hit, but after the week I had off and the work I had done I felt like my confidence was pretty high." Australia opener Chris Rogers, who made a dogged 52, hailed the performance of Anderson and Steven Finn, who took 2-38 on his return to the side after two years out - a period in which he was deemed "unselectable" by the England management. "Finn was particularly good," Rogers said of his former Middlesex team-mate. "I saw him at his lowest ebb, when he was in tears during a county game at Edgbaston and it is a long way back, so credit to him. "I think their group as a whole bowled well. Anderson comes into his own in conditions like this."